New England is noted for its fall foliage, but I think that Colorado’s fall colors must be, if not first, a close second. Everyone celebrates the golden aspen running down the drainages like a prospector’s dream come true. 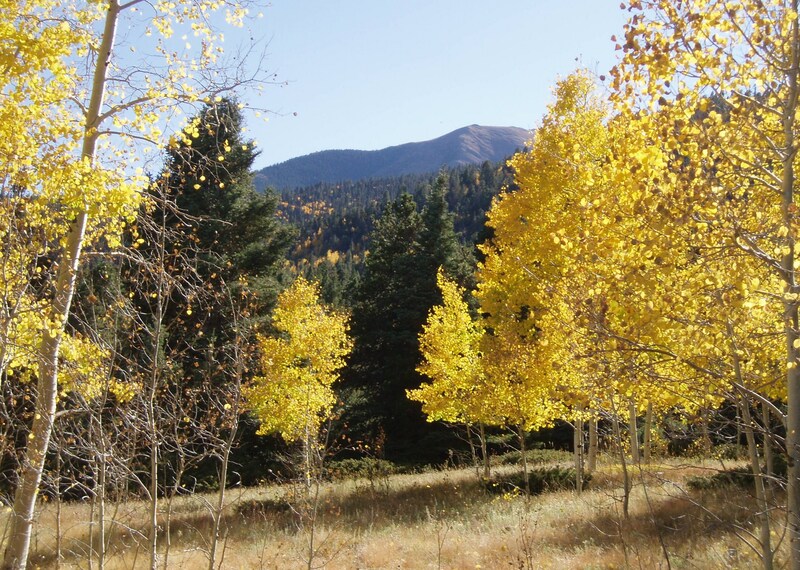 At first, the quaking aspen shimmer newly-minted golden coins, and then as the season wanes, the color fades to old gold. The aspen are brilliant, but my choice for color is the scrub oak. The Renaissance colors range from burgundy to bronze to burnt orange to grass-green to forest green to flame. The flame leaps – red, orange and yellow. Driving up the Hardscrabble, I wish that I could reference color chips from Sherwin Williams. I lack for descriptive words. Come fall in Colorado, deterring deer is an issue. Everyone has tried everything. Many things work a short while, but deer are smarter than you give them credit for. After a couple of weeks, they ignore both commercial and homemade efforts. Overhearing their snigger as they saunter through the yard, hardens my heart. They don’t even have the decency to look guilty and flee on my approach. They look me in the eye. They dare me to blink first. My living two blocks from Main Street, Westcliffe, does not faze them. Driven by the on-going drought, the deer are in search of food. They like my red and black current bushes. They are particularly fond of flowers. The more expensive the flower, the more tasty the deer find them. They are gourmands of sorts. They nose out the perennials and eat them first. Their preference is to eat blooms and tender shoots. Adding insult to injury, these very smart deer keep a calendar. They keep an eye on hunting season. Come archery and black power season, they begin to make their way out of the foothills and into the Valley where they bed down on the sunny side of our house where they are warmed by the sun and out of any chilly breeze that might ruffle their tenderness. From time to time they leisurely arise and walk to the sapling aspen where they rub the velvet off their antlers. 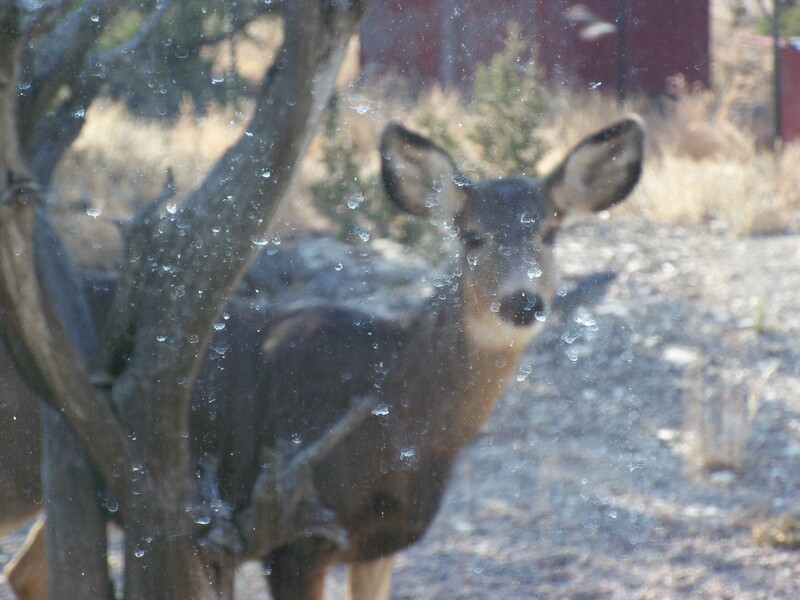 It is their buffing their antlers on my aspen that drives me crazy. I’ve tried a number of remedies – to no avail. Rifle season starts October 20, this coming Saturday, and at the sound of the first shot, the deer will come in droves. But I am ready for them. 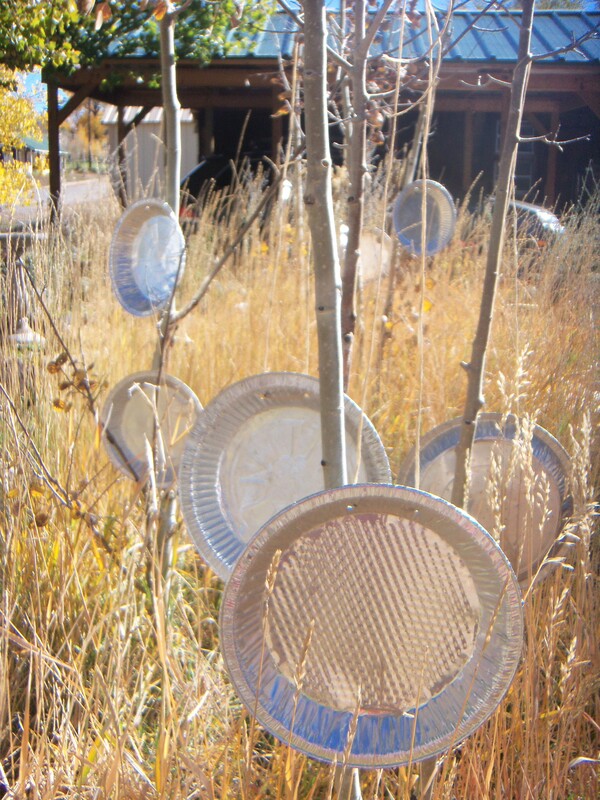 Swinging from the lower branches of my aspen, I have strung disposable aluminum pie plates. They are eye-squinting shiny in the sunlight. Plus, the plates twirl and ping as they clink against each other in the breeze. If I were a deer, I would be put off. Unfortunately, I am not a deer. As a back-up, I’m frothing up a home recipe recommended by the Custer County Extension Office. The recipe is as follows: whip one part whole eggs with four parts of water. Apply on a dry day with temperatures above freezing. I’m on it. First the aluminum pie pans and then the egg wash.
And readers wonder why I don’t spend more time writing! This entry was posted in Uncategorized and tagged deer deterrent. Bookmark the permalink. Thanks for the aspen photos. My hubby and I had toyed with the idea of dashing out there over a two-day weekend to see the aspens but we’re 14 hours away and sanity finally stopped us. Next year we’ll be there, sanity be damned. Thank you for writing. I agree – sometimes we are all too serious and reasonable. I’m thinking that the older we get, the more we should throw all caution to the winds.